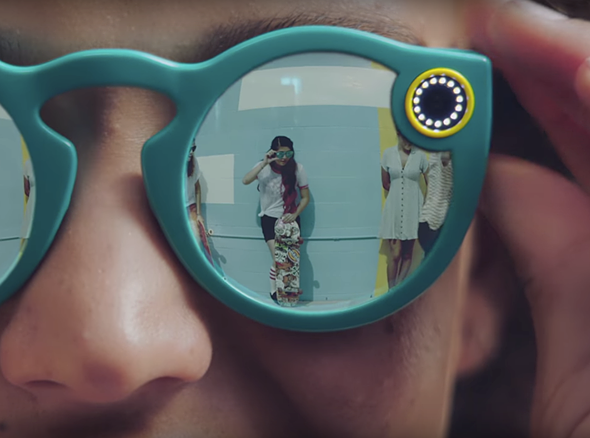 Snapchat unveiled its first hardware product over the weekend, a pair of sunglasses with a built-in camera called ‘Spectacles.’ With the new product comes a new company name: Snap Inc. The name change, Snap explains, is directly tied to the launch of Spectacles. With the product, Snap has become more than a company centered around the Snapchat app, and the new name reflects this expanded focus. The sunglasses feature a built-in wireless video camera that records circular videos with a 115-degree ‘human perspective’ field of view. The glasses also include an integrated battery able to sustain a day’s worth of recording on a charge, as well as Bluetooth and Wi-Fi for shuttling content from the device to the user’s smartphone and, specifically, the Snapchat app. According to the Wall Street Journal, the sunglasses feature a button near the hinge to initiate recording, which happens for up to 10-second durations. The publication also states the glasses will be priced at $129.99 ‘with limited distribution’ and a slow rollout as the company tests the waters.